Plump and tender. 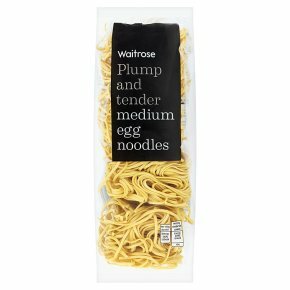 Made with free range egg, perfect for adding to Oriental soups and stir fries. Hob. Bring a pan of water to the boil. Place the noodle nest in the water and immediately turn off the heat under the pan. Leave the noodle nest soaking in the hot water for 4 - 5 minutes or until cooked. This can be assessed by breaking the noodle in two, along its length and checking for a fine white core. Gently agitate the noodles to separate them with a fork, from about halfway through the cooking period. Drain the noodles through a colander. Serve immediately.